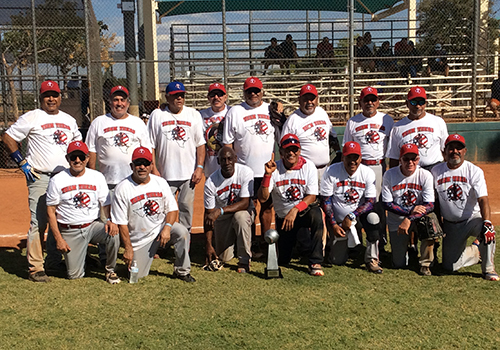 LAS VEGAS – The 2018 Las Vegas Senior Softball Association (LVSSA)/Senior Softball-USA (SSUSA) World Masters Championships, the largest Senior Softball tournament in the country (621 teams in 2018), began play with the Men’s 55 and 60 age divisions taking on Sin City, Sept. 20 – 23. A total of 192 teams competed across eight divisions in the opening session. 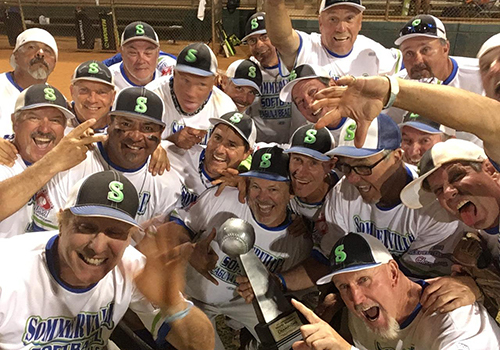 Starting with the 12-team Men’s 55 Major Plus Division, Sommerville Softball (CA) captured the ultimate prize of the Triple Grand Slam. Sommerville entered the tournament as the Western National Champion, taking on the Eastern National Champion, RBC Wealth Management (FL), in the US National Champion Game. Sommerville won the game, 25-2, to enter bracket play as the top seed. In bracket play, Sommerville won three straight games to reach the championship game, where the team suffered its lone loss of the tournament, 24-22, against NW Legends (WA). Sommerville would avenge its loss with a 31-29 win in the “if” game, to take home the World Masters Championship and Triple Grand Slam. NW Legends won four straight elimination games, including the championship game, en route to their runner-up finish. RBC Wealth Management finished third, while CornerStone (OR) rounded out the top four finishers. In the largest division of the Men’s 55 age group, the 37-team Men’s 55 Major Division ended in anticlimactic fashion. Ohio Elite/Creative Stucco/Louisville Slugger won the division via forfeit, with WC Thunder 55 (IL) unable to compete in the “if” game due to injuries, after winning the championship game, 37-33. The 55 Major Division was split into two pods following seeding play, the American (18 teams) and National (19 teams). Ohio Elite entered the National Pod as the No. 9 seed and won five straight games to secure their spot in the championship game. WC Thunder, the No. 7 seed in the National Pod, won three straight bracket games, before falling to Ohio Elite, 34-22, to drop down into the elimination side of the bracket. Facing elimination, WC Thunder knocked off 55 OH MY (CA), 26-15, Rock n Legends (TX), 26-25, and So Cal 55 (CA), 24-18, to reach the championship game. So Cal 55, the No. 12 seed in the American Pod, started off strong with four straight victories, before suffering back-to-back losses to finish in third place for a second straight season. Rock n Legends, the No. 8 seed in the National Pod, got off to a rough start, losing back-to-back games to start off bracket play. The team would regroup, however, rattling off six straight games to eventually finish in fourth place. 55 OH MY and West Coast Water I (NV) both reached the final day of play as well, falling short of the top four finishers. D&K Tradition (CA), the Western National Champion, was the default US National Champion with no opponent from the East. Entering bracket play as the No. 13 seed in the American Pod. D&K Tradition posted an even 2-2 record in the bracket to fall short of the completion of the Triple Grand Slam. In the 33-team Men’s 55 AAA Division, Ameriprise FL Legends entered bracket play as the top seed following its 20-16 win over Michael’s Automotive Group (WA) in the US National Championship game. 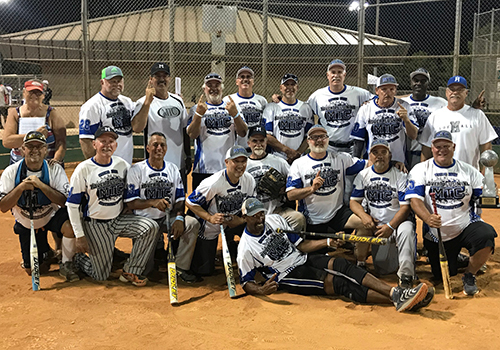 Ameriprise FL Legends would fall just short of the ultimate prize of the Triple Grand Slam, as the team fell in the championship game, 23-14, against Crossfire (TX). Crossfire posted a perfect record, going 2-0 in seeding play and 6-0 in bracket play. Fresno Heat made a solid push through the elimination side of the bracket with four straight wins en route to their third-place finish, while Texas Heat 55 finished in fourth place. Old Stars (IN), Fifty GZ (TX), Scrap Iron-Colorado Home Fitness, Shootz Maui (HI) all advanced to the final day of play as well. 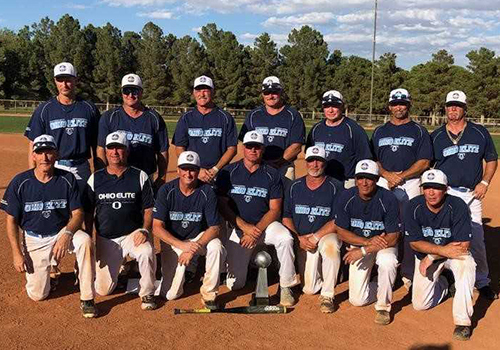 New Mexico Boomers won the 10-team Men’s 55 AA Division, as the team completed an undefeated weekend, going 2-0 in seeding and 4-0 in bracket play, including a 16-14 win over Scrap Iron Mile High (CO) in the championship game. 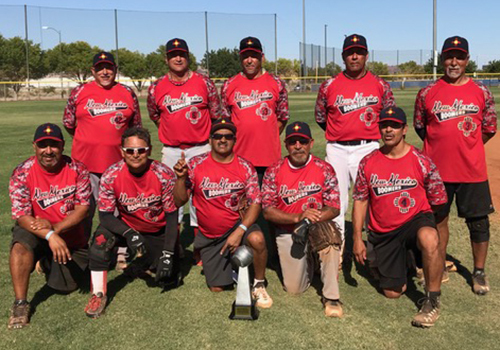 For New Mexico Boomers, the team finally got over the hump, after posting back-to-back runner-up finishes at the WMC in 2016 and 2017 in the Men’s 55 AA Division. 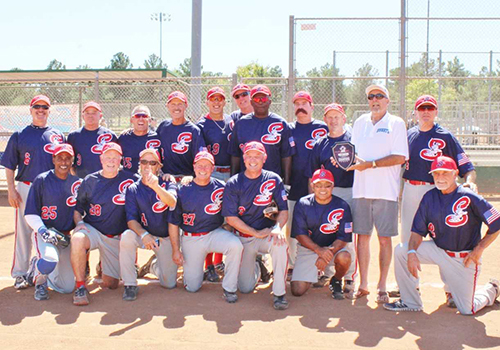 The team previously won the World Masters in 2014 in the 50 AA Division. Additionally, this is the team’s second major championship of the 2018 calendar year, as New Mexico Boomers won the Tournament of Champions back in February. Longshoremen 55 (VA) and Spin Tees (WA) played for the US National Championship, with Longshoremen earning a 23-16 victory. Spin Tees eventually finished in third place, while Longshoremen finished in fourth place, falling short of a Triple Grand Slam completion. The nine-team Men’s 60 Major Plus Division saw a repeat champion. Entering bracket play as the No. 5 seed, MTC 60’s/Dudley (CA) went 4-0 in the bracket, including a 25-23 win over top seed and US National Champion, Summy’s (CA), in the championship game. MTC 60's/Dudley won the 60 Major Plus Division in 2017, as well as the Men's 55 Major Plus Division in 2016, for the team's third straight WMC title. During seeding play, Summy’s defeated Hollis Appraisals 60’s (FL), 19-5, in the US National Championship game. Hollis Appraisals would go on to finish third in bracket, while Texas Crush Sixties rounded out the top four finishers. 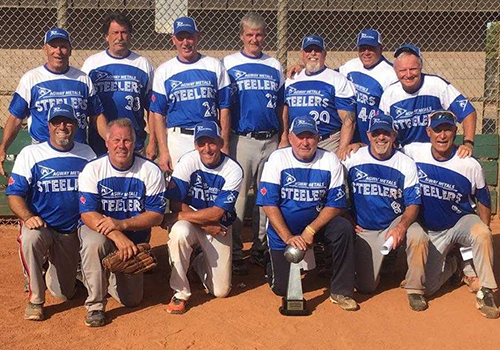 In the 31-team Men’s 60 Major Division, Agway Steelers (Ontario, Canada) brought the championship North of the Border, as the team went 2-0 in seeding play, before remaining perfect in the bracket with a 6-0 record, including a 19-5 win over Minnesota Masters/Ancell in the championship game. MN Masters/Ancell got the championship game coming out of the elimination side of the bracket with wins over Windy City Softball (IL) and Sin City Softball (NV). The team started off with three straight wins in bracket play, before falling to Agway Steelers to drop down into the elimination bracket. 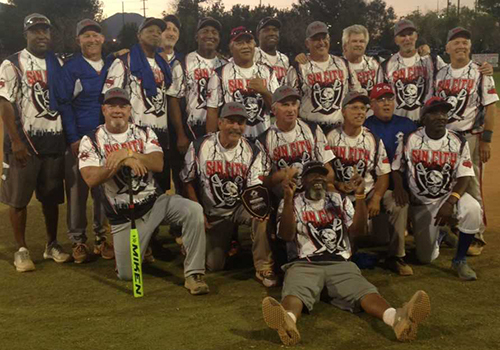 Sin City Softball, the top seed and US National Champion following its thrilling 22-21 victory over Tasty Pizza (MN) in the US National Championship game, was unable to defend its home turf and complete the Triple Grand Slam, finishing in third place. Tasty Pizza had a solid run through the elimination side of the bracket with four straight wins, before being eliminated by MN Masters/Ancell, to finish outside of the top four. Cardot/Madalena Construction (NY) also finished just outside of the top four, as the team rattled off five straight wins in the elimination side of the bracket, before being knocked out by Windy City Softball. Windy City Softball finished in fourth place. Rounding out the eight teams that played on championship Sunday were Promotion (NJ) and Smith Mason Dudley (LA). The largest division of the entire first session, the 43-team Men’s 60 AAA Division, saw the bracket split between the American (21 teams) and National (22 teams) pods. 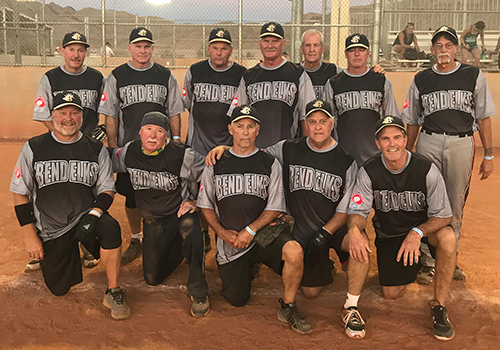 Senior Bend Elks (OR) began bracket play as the top seed in the American Pod, following its 20-17 win over Georgia Alabama Seniors/GAS Softball in the US National Championship game. Georgia Alabama Seniors took the top seed in the National Pod as the runner-up. Looking to capture the Triple Grand Slam, Senior Bend Elks advanced to the final day of play, but would be eliminated in the team’s first game of the day against Crossfit/Great Clips (NC). 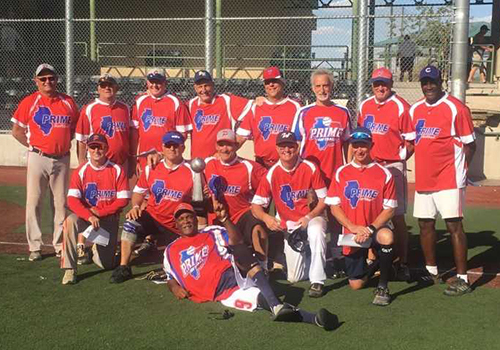 Chicago Prime 60s (IL) and Northwest Softball Club/Underdogs (WA) entered championship Sunday in the driver’s seat, as the two unbeaten teams. Chicago Prime defeated Northwest Softball Club/Underdogs, 22-18, to advance to the championship game; while Northwest Underdogs Softball Club/Underdogs came back with a 23-8 win over Auto Accessory Distributing (OR) in the third place game to set up a rematch in the championship game. Chicago Prime downed Northwest Softball Club/Underdogs for a second time, 21-17, to win the championship. Chicago Prime, the No.13 seed in the American Pod, competed a perfect bracket going 7-0. Big Daddy’s Donuts (MO) finished in fourth place. 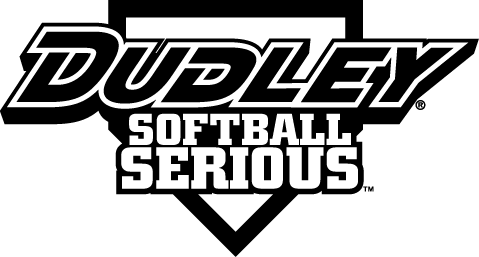 Scrap Iron Xplosion (CO) and CJ & S Express (AZ) also advanced to the final day of play to be among the final eight. 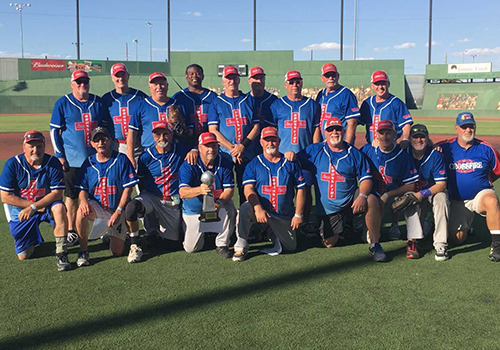 In the 17-team Men’s 60 AA Division, Team Texas San Antonio came back to win the “if” game, 11-10 over Git-R-Done 60 (CA), after dropping the championship game, 26-23. Team Texas (SA) defeated Git-R-Done earlier in the bracket to knock them down into the elimination side of the bracket. Git-R-Done would bounce back with a pair of wins in the third-place game and championship game to force the “if” game. Northwest Silver 60’s (WA), the No. 12 seed, made a valiant run through the elimination bracket with six straight wins en route to a third-place finish. Vancouver-Wooly’s (WA) rounded out the top four finishers. Pastimers (WA), the Western National Champion, was the default US National Champion with no opponent from the East.